The United States Patent and Trademark Office (USPTO) campus consists of multiple buildings anchored by the main Madison Building at 600 Dulany Street, in Alexandria, Virginia. The Madison Building is identifiable by its soaring central glass atrium joining the East and West sides of the building. We are easily accessible by various public transportation and conveniently located just off the I-495 Beltway. The USPTO is a short walk from both the King Street Metro station (yellow and blue lines) and the Eisenhower Avenue Metro station (yellow line only) and is served by both Metrorail and Metrobus services. See the WMATA website for more info. Alexandria Union Station, adjacent to King Street Metro station, is served by both Amtrak and the Virginia Railway Express (VRE) commuter railway. Alexandria's local bus system has several routes with stops near the USPTO, with the AT7 line being the closest. Please see the DASH schedule for more information. 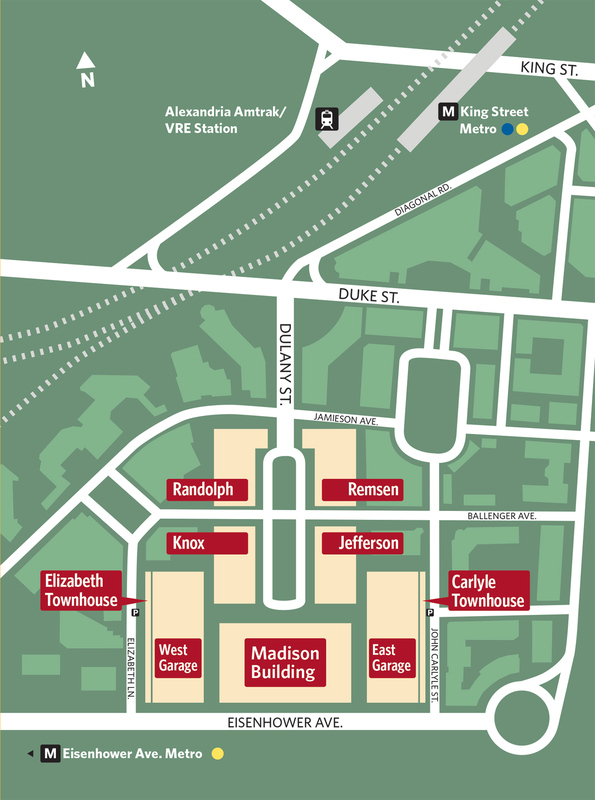 Public garage parking immediately adjacent to the Madison Building is available for purchase in the East Garage (recommended) and in the West Garage. Hourly and daily parking is on a first-come, first-served basis. In the uncommon event that both garages reach capacity, parking will be limited to monthly permit holders and USPTO employees, but other public garage parking is amply available in the immediate area. Limited hourly pay street parking is also available.